StopTech's Balanced Brake Upgrade equips your 07-09 Mazda MPS3 with larger two or four piston front calipers and plus sized StopTech AeroRotors. 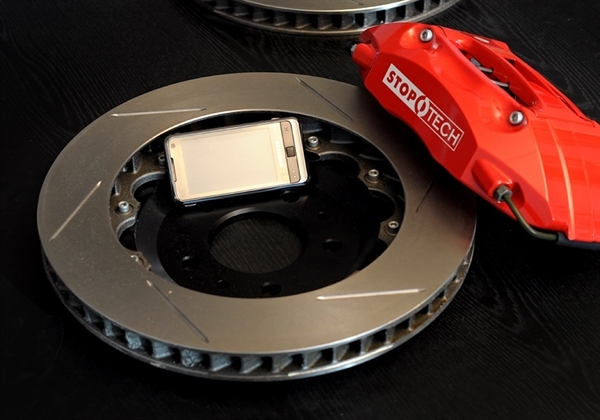 StopTech big brake kits provide a neutral biased brake system that will improve safety and performance on and off the track as well as add a striking visual enhancement that is second to none. StopTech big brake kits also include stainless steel brake lines and StopTech performance brake pads to complete the package. Adding the StopTech ST-40 calipers to your MS3 as part of the Balanced Brake Kit will give you the advantage of one of the stiffest calipers on the market. 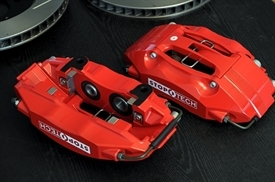 StopTech's calipers incorporate their bolt-in bridge, which is strong enough to dramatically reduce caliper distortion yet does not sacrifice the caliper's cooling. The squeeze forged StopTech calipers have the least flex of any tested after market or OEM caliper. The air channel in the bridge is designed to help air flow through the retainer, resulting in better cooling. A stiffer caliper on your MPS3 means improved performance without added vibration, noise or pad taper. You will also benefit from better pedal feel under extreme braking conditions. You can brake confidently, knowing your calipers are staying cool as you dive into the next corner. 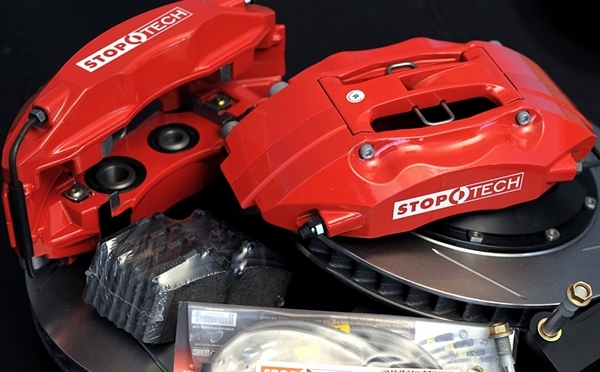 The StopTech big brake kit uses StopTech's patented Two-Piece Floating Directional Aero Rotors with your choice of several rotor diameters, featuring their innovative leading and trailing edge designed cooling vanes. The unique vanes inside the disc maximize airflow through the AeroRotor to reduce turbulence and flow more air than any rotor tested. AeroRotors provide up to 80% better airflow over original equipment rotors and 10-30% better airflow than other directional vaned racing rotors. What does that mean for you? Your MS3's rotors will stay cooler lap after lap (or stoplight after stoplight). 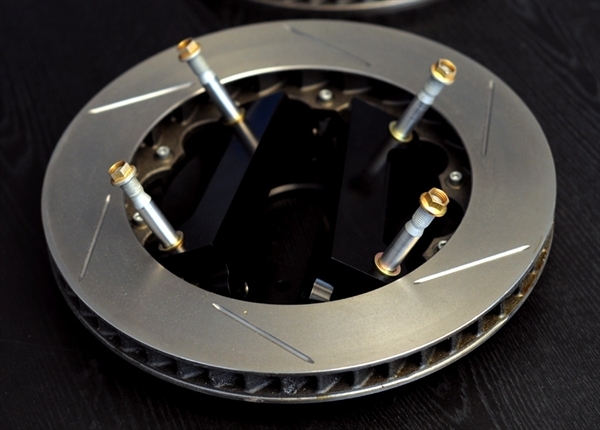 Cooler rotors are less prone to warping and cracking, and will also help to prevent brake fade and/or failure. StopTech makes their own stainless steel brake lines for your MPS3 in Southern California. StopTech is a DOT (U.S. Department of Transportation) registered supplier of stainless steel brake lines. Line material and fittings are all made from the highest quality parts available. StopTech's brake lines feature a clear, abrasion-resistant cover for maximum protection against chaffing. Necessary quality control procedures are in place to ensure lines are the correct length and every fully assembled StopTech stainless steel brake line is tested to a pressure of 4,500 psi. The supplied StopTech performance street pad is and excellent choice forS3 and function great for the occasional autocross. If regular trips to autocross events or track days are in your MS3's future, be sure to purchase a more appropriate pad for those events. * These kits may NOT fit your wheels (especially stock unless specifically noted), you MUST measure before buying, there are no cancellations or returns on Stoptech Big Brake kits as they are a special order product. * We accept no responsibility for fitment issues related to aftermarket wheels. Before purchasing, you must measure the clearance behind your rims and call us to confirm fitment. * All Stoptech kits are made to order, they can take approximately 2 weeks for standard kits, 30+ days for special options such as colored calipers, etc. No returns or cancellations will be honored for special order items.